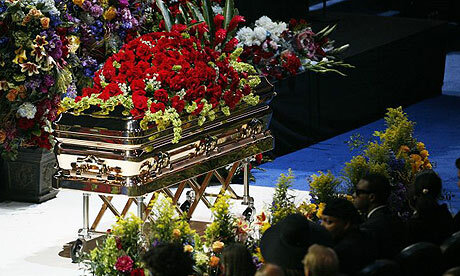 Casket if Michael Jackson on staples center. The plans for Michael Jackson’s burial and his cause of death remained elusive today, as emerging details of the condition of the late singer’s body fuelled speculation of drug use and ill health in the days before his death. Jackson’s body had track marks on the arms and his veins were collapsed, suggesting a history of intravenous drug use, cable news channel CNN reported. The network cited a source who had seen the body and described it as emaciated and “lily white” from head to toe, and said the pop star had no hair. But Jackson’s dermatologist Arnold Klein said the star had been in good shape during an office visit three days before his death on June 25. The powerful sedative Diprivan, also known as Propofol and usually administered by anesthesiologists in hospitals, was found in Jackson’s home. Klein told the network he had not given Jackson the drug but said the star could obtain any drugs he wanted. In Los Angles, assistant chief coroner Ed Winter said that investigators were holding Jackson’s brain, or part of it, and that it would be returned to the family for interment after further tests. Authorities in Los Angeles released the entertainer’s death certificate, which did not list a cause of death. The document, which was filled out with information given by Jackson’s younger sister LaToya, lists Jackson’s occupation as “singer”, and his industry as “entertainment”, and that he had been in the business for 45 years. It lists his race as “black”. The Jackson family was mum today on plans for Jackson’s burial. Regulations prohibit the family from burying Jackson at his Neverland ranch. The death certificate states he was to be temporarily interred at the Forest Lawn cemetery where his family held a private memorial services yesterday. Meanwhile, even as US newspapers, news websites and television channels continued their blanket coverage of the singer’s death and memorial service, a media backlash appeared to be brewing. “Enough!” wrote New York Post columnist Andrea Peyser. “You got two for the price of one if you attended Michael Jackson’s spectacular dog-and-pony show yesterday – a memorial as dignified as a Vegas lounge-lizard act combined with the entertainment value of a carnival freak show.